In the artscroll Talmud, when a quote is made from Rashi, the reference always starts with these letters. What do they mean? You wouldn't just say "Rashi's comment on page 84a", as that would have you looking all over the page. Instead, each comment of Rashi is prefaced by the Talmudic phrase on which he's commenting. (In some newer editions it's bold or a different font, to help you locate it more easily.) This is known as דברי המתחיל, (divrei ha-mas-chil or ha-mat-chil, Ashkenazic or Sephardic pronunciation), "the starting words." At the bottom, Rashi quotes the Talmud's phrase "Chalavim", and then comments -- "shel kol korbanot." 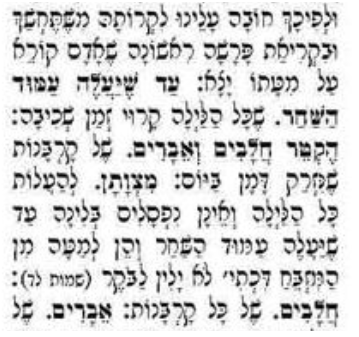 So you would refer to this comment of Rashi as "Rashi, Berachot 2a, ד”ה חלבים"
ד"ה = Divrei Hamaschil / Hamatchil. It means the Rashi begins with these words. This helps one find which Rashi the reference is referring to. It stands for דיבור המתחיל Dibur Hamaschil, not דברי המתחיל divrei hamaschil, which is a very common mistake. I heard this from Rabbi Yisroel Belsky. Called it a mistake were his words, not mine. He explained that divrei refers to the words of someone in particular. For instance, you would say divrei Rashi, meaning the words of the Rashi. Dibur refers to a particular idea that was said. So when referring to a specific sentence or idea in Rashi, the proper term is Dibur Hamaschil, that idea which begins with the words etc.